Presence – A Handbook for Enlightened Living” is a book that is more than just a read, it is a powerful and transformational journey into the heart of you. Its words will guide and help free you from debilitating fears, constricting circumstances and negative conditioning of your past. “Presence” will open you up to the immense power and potential already present within you. This in turn will allow you to begin to create a more fulfilling, joyful and peaceful experience of life. “Listen to the silence. Drop beneath the noise that surrounds you. The silence sits beyond the sounds you can hear. This silence is the bedrock from which all sounds emerge. It is like being on a boat in the ocean, feeling the motion of the waves whilst aware of the powerful dark stillness of the water deep beneath all surface movement. When you listen to the silence you will begin to hear its voice. From the heart of hearts into your heart, this voice whispers eternally the wisdom you long for, the answers you burn for, the peace you yearn for. This is the loving voice that lulls you to sleep in your darkest hours, even when fear cripples. This is a love that persists even as you rail against your suffering, furious in your helplessness. This whispering in the silence calls you to know its presence. So listen to this most ancient of voices that spoke before you had ears to hear and will continue to guide you long after your body becomes the breeze. For this whispering created the life that you are. There is nothing for you to do. Lean into the voice, rest your head upon its wisdom and fly free as you surrender to its infinitely quiet Presence. Through the following pages, offered with Lightness and Grace, Sa offers us the opportunity to peer through the eyes of Awakening by showing portals that lead back into our own true identity, to the one that peers through the eyes of all that lives and breathes. By investigating first, what holds us captive and then offering a way back into our own innate freedom, every page invites the reader to contemplate and explore just how very close and immediate Awakening actually is. Whether it be asking the Trees how to be, through to recognising the perfection that is already right here, her reflections constantly and consistently gently nudge the reader back into their own true nature as Presence Itself. Sa has the ability to pick a moment and investigate through a keen mind and awakened heart, just what it is offering. She knows that every moment is sacred, thus being another unique opportunity to be transported back into who and what we truly are. She takes a normal, everyday activity or situation such as work or suffering and scratches the surface to begin to shine a light on just what makes it tick. And, as we journey through her own encounter with each moment, she awakens something fresh and new within ourselves. Sa’s ability to access both her Inner Child and her Inner Teacher, makes this book a beautiful celebration of all things that open the heart and bring us right to the very doorway of pure presence in the realization that each moment always offers its own wisdom and its own blessing. Each page offers a rare and precious insight, leading us always back to the One that is always present, always vast, always clear – that One that is looking out and in, forever at peace and without limits. Through her words, we are visited by a loving heart, always offering a view that uplifts and awakens. And through her loving heart we are given direct access to our own. This is Sa’s gift. May you discover your ever-present freedom. with your payment so we can deliver your items promptly. 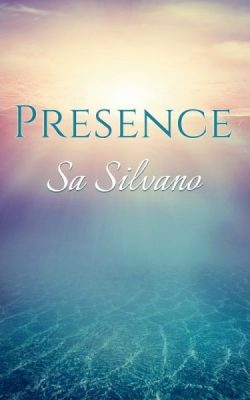 The beauty of Sa Silvano”s new book “Presence” is that it’s an experiential read, which means that as you read through the Chapter themes, an opportunity presents to enter into the spaciousness of presence that Sa writes about. As you read further, you begin to feel into and deepen the experience of the art of presence. It’s a book that offers the reader a doorway through which one can understand the presence that exists within all of us, as well as practical strategies to enter more fully into the experience. For example, when you read the words, ” Be present. Soften into the moment”, you find your body softening and an increasing awareness of your own state of presence. The gift from this special book is the lingering experience of being present long after the book is finished. Sa”s book is an important contribution for all those seeking a freedom from the mind to discover more fully the beauty of what is within us and others. “Sa’s new book “Presence” illuminates a pathway for us and guides us to live fully in this moment. I am really loving your book Sa, I’ve been reading it slowly so I can sit with each entry and let it sink into my being. It is beautifully written and every sentence is an invitation to go deeper into Presence. So thank you for your words of wisdom and insight. “I had only ever edited fiction before and, from an editor’s perspective, didn’t really understand what Sa meant by “Presence”. Of course I knew what the word meant, but realised there was obviously more to it than just a word. At the time I was editing Sa’s book I was going through a tough few weeks personally. Then I realised that I was actually drawing on what I had read to help me not only cope, but sail through that time and come out feeling refreshed. Soon after I finished editing, I had the opportunity to share what I had learned from Sa’s book with a dear friend. As I spoke with her I actually got goose bumps as the words from the book flowed from me and my friend’s face lit up. She understood. 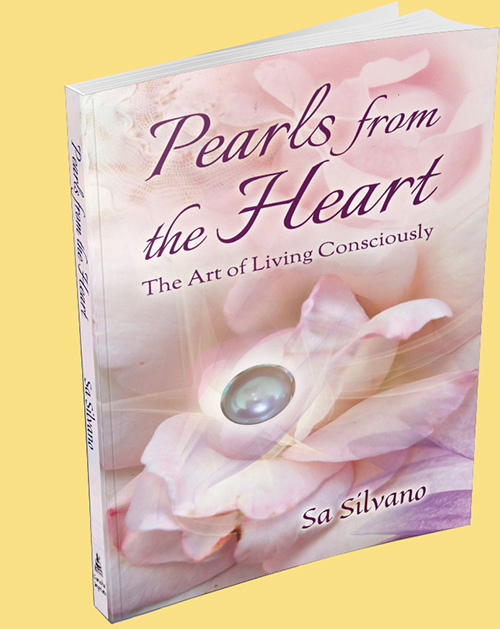 “Pearls from the Heart” is a book that offers loving and compassionate guidance to living with greater consciousness. For times when life is difficult to manage, when anger, frustration, grief or fear overwhelm you to the point where you may find yourself powerless to act, this book offers shining pathways that will gently but firmly guide you out of confusion, reconnecting you with yourself and enabling you to embrace your life in a deeply accepting and loving way. Sa Silvano offers insights and wisdom gained through the experiences and lessons of her own personal healing journey, as well as through her work of assisting many others. “Pearls from the Heart” is truly a guide to living consciously, and offers the reader many gifts of healing, transformation, inspiration and awakening. “I can feel Sa’s heart in every page. This book emphasizes how wonderful every bit of our life truly is, no matter how painful, messy or weird it can sometimes get. How we can turn a crisis or grief into an awakening and growth.